One of the top concerns for prospective trampoline buyers is safety. And it’s more than wanting to find the safest trampoline brand. As parents, we care deeply about the safety of our kids and want to make sure that the act of trampolining is safe. It’s no surprise: The trampoline industry has been stagnant for a while. 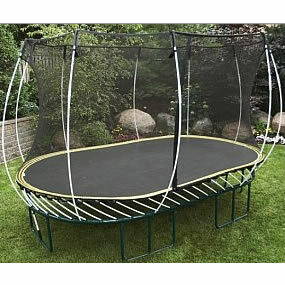 But that all changed about ten years ago with the breakthrough SpringFree trampoline company. A parent turned his frustration for unsafe trampolines into a passion. See Current Pricing & Discounts. Now, the SpringFree is the undisputed champion of, “safest trampoline 2015”. Check out the Youtube video below. It shows just how safe the SpringFree trampoline really is. There isn’t a one-size fits all answer for this. Parents across the world have polarizing opinions on this topic. One the one hand, some parents believe it’s a great outdoor sport that keeps their kid active. While they acknowledge the risk, they believe it builds character. Their core belief is that there will always be dangers in life, and you can’t keep your kids in a bubble their whole life. On the other side of the coin, there are statistics that prove trampolining that leads to injury. With this knowledge, these parents find it impossible to let their kids jump on trampolines. Nobody is wrong or right, and at the end of the day it will always be the parent’s decision. I’ll admit, this rule didn’t fly when I was a kid. Trampolining by yourself can be fun for a little while, but it was always the most stimulating when there were two or three jumpers. While it’s dangerous, the main reason was to get that “extra high double bounce”. As a parent, you will need to decide whether to stay strict to this rule. Statistics shows that the lighter jumper is five times more likely to get injured than the heavier jumper. That’s because the lighter jumper will lose control and have a greater chance of landing on awkward areas. It’s a fact: One jumper is safer. Will you be able to stay strong when your kids start complaining? It might seem like a given, but kids like to sneak in a trampolining session when no one is watching. When I was a kid, I can remember hanging out a friend house. Their parents were watching us but had a take a phone call. We were told not to jump while they were inside, but that didn’t stop us. Kids love to rebel, and you will need to be strict with the supervision rules. While you are watching a jumper, make sure they stay towards the center of the trampoline. The outer frame is the most dangerous spot on the trampoline. Make sure your trampoline isn’t too close to anything that might cause injury. If you or your child happens to fall off the trampoline, the last thing you want is there to be an obstruction. One of the worst areas to set up a trampoline is close to a pool. Not only does the risk of injury increase if someone happens to fall off, you are enticing your kids to jump on the trampoline to the pool. If I were a kid and had the chance to make that jump, I wouldn’t hesitate. Where Do Trampoline Injuries Occur? Okay, we’ve talked about things you can do to increase your trampoline’s safety, but where do most injuries occur? And what can you do to reduce the risk of injury for you and your kids? The most dangerous area on a trampoline is the spring area. Your trampoline should already have a spring cover, but sometimes it doesn’t work like it should. In addition to the spring area, the outer frame is one of the most dangerous areas. The spring cover should provide a little protection from the metal frame, but that’s not always the case. Like the spring area, the cover tends to slide around a leave undesirable areas unprotected. One-third of all trampoline injuries are caused by coming in contact with the outer metal frame. The most common types of injuries are sprained and broken bones. Occasionally, jumpers hit their head against the metal frame, which could cause horrific damage. There have been trampoline injuries that have caused paralysis and even death. The outer metal frame is the single most dangerous spot on a trampoline. Say Goodbye To The Metal Frame? The inventor of the SpringFree trampoline was frustrated and invented a trampoline that eliminates the metal frame. That’s right! The metal frame is removed. Does That Mean There Will Never Be An Injury? No. The act of jumping is inherently dangerous. Even with the metal frame removed, that doesn’t mean a jumper can’t land awkwardly and sprain their ankle. That being said, the SpringFree trampoline is the safest trampoline brand on the market in 2015. There isn’t even a competitor that comes close with SpringFree. Trampolines will always carry the risk of injury. There are proven methods to reduce injuries, such as one kid at a time and parent supervision. However, even if all precautions are taken, it doesn’t remove the metal frame. A jumper always has a chance of landing awkwardly on this area. The only way to reduce this risk is to go with the revolutionary SpringFree trampoline.